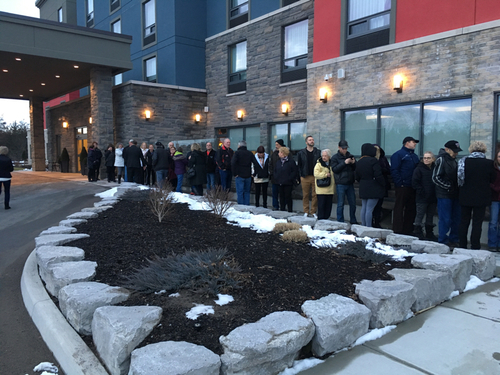 BELLEVILLE – An eager crowd of about 1,500 people ready to try their luck went to Wednesday’s grand opening of Belleville’s Shorelines Casino. The Bell Boulevard venue features 450 modern slot machines and 18 spots for table games like roulette and blackjack. There is also a section dedicated to video horse-racing games. But betting isn’t all there is to take part in, said Great Canadian Gaming Corporation’s vice-president of stakeholder relations and responsible gaming, Chuck Keeling. The opening night’s on-stage entertainment included a ventriloquist, a Katy Perry cover artist and Kingston country band Ambush. 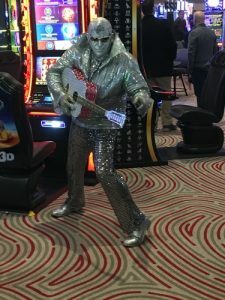 Mixed into newly trained staff on the casino floor were an Elvis impersonator, a fire-eating man on stilts and women wearing feather headdresses. Local entertainment will be a priority in the casino’s operations, said Andy LaCroix, executive director of Ontario operations for Ontario Gaming East, a division of Great Canadian Gaming. The plan is to get a live act for every weekend. This will take advantage of large glass patio doors that open up to an outside stage area, LaCroix said. Local brewers have been contacted to see if they want to make their products available for purchase. A buffet with different offerings each day of the week is also on-site. Another unique fixture is a PlaySmart Centre, a nook in the casino dedicated to teaching newcomers and problem gamblers safer ways to play. “It’s a big part of gaming, that responsibility aspect,” LaCroix said. 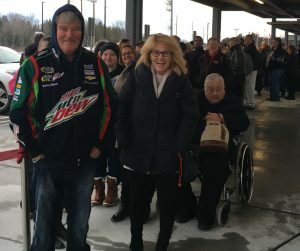 Gary and Susan Matier of Belleville, who told QNet News that they have won upwards of $80,000 gambling, were at the front of the line to get in about two hours before doors opened. The couple said they are thankful to have a casino closer to where they live. 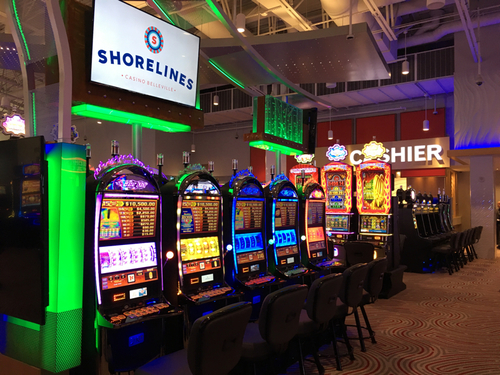 But local poker fans might still find themselves making the trip to Gananoque’s Casino Thousand Islands, as that is one game Shorelines in Belleville doesn’t offer. That didn’t sit well with one of the people lined up to get into the casino Wednesday. The man, obviously irate, said that thousands of people in Belleville play Texas Hold ‘Em. Susan Matier offered some advice for less seasoned casino patrons. “You take whatever you can play – don’t break your bank account. Just relax, have fun and walk away,” she said. Early attendees like the Matiers received gifts of commemorative champagne glasses and other Shorelines-branded merchandise. 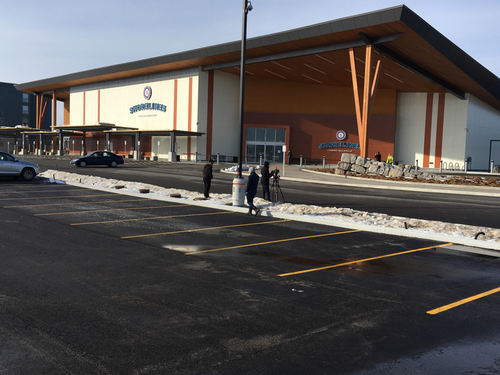 Local politicians on hand, including Mayor Taso Christopher and Bay of Quinte MP Neil Ellis, said they are looking forward to seeing the casino’s effect on Belleville’s financial situation. A total of 275 jobs are being created by the casino, and revenue from it is going toward economic development and other reserves. The city won’t receive its first cheque until the end of April, but Keeling said it has been a successful venture at other casino locations. “We know it will be a meaningful amount based on similar-sized communities that are generating revenue right now,” he said. Attendance at the casino is expected to fluctuate from hundreds on weekdays to over 1,000 on weekends and for special events, Keeling added. 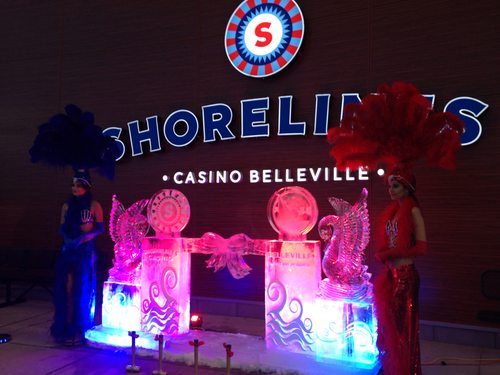 Shorelines is the first casino to come to Ontario since 2006. LaCroix said Belleville was chosen because of the area’s growth and proximity to Highway 401.